JOHNSON COUNTY—The culture of vocations in central and southern Indiana is spreading. The participants came from 22 parishes and nine deaneries in the archdiocese. Four participants who are members of parishes in the Lafayette Diocese also took part in the camp. Bishop Bruté Days is a retreat and camping experience for young men open to the idea that God might be calling them to the priesthood. It is sponsored by the Bishop Simon Bruté College Seminary in Indianapolis. Archdiocesan priests are present throughout the event, giving presentations on the faith, celebrating Mass, hearing confessions and presiding over Benediction in addition to being present to the young men in many informal situations. “These guys have more energy than Quaker has oats,” said seminary vice rector Father Paul Etienne with a laugh after the various groups of campers and their seminarian counselors did their often raucous group cheers on June 12. 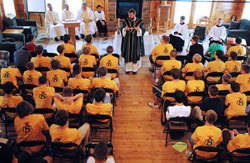 Seminarians serve as camp counselors and lead the young men in morning and evening prayer services and also in outdoor activities such as dodgeball and soccer. Members of the Knights of Columbus and the Indianapolis Serra Club provided meals for the camp. Bringing together young men who are thinking about the priesthood from across 39 counties helps them feel less alone in their thoughts, said camper Jay Cougan, a member of Immaculate Heart of Mary Parish in Indianapolis. “In this type of atmosphere, with seminarians and priests, I think it’s a lot more open for kids of all ages to explore their vocation from God, whatever it may be, and to be proud about it and not feel pressure … about that. It’s an open and positive [environment],” Jay said. In fact, after being at the camp for just a day, Jay felt a real bond with the other young men there. Although Bishop Bruté Days helps teenage boys explore a possible priestly vocation, it is also a time for archdiocesan seminarians to test their leadership skills. Seminarian Gregory Lorenz, a member of St. Roch Parish in Indianapolis, finished his first year at Bishop Bruté just weeks before he served as a camp counselor. He said being a leader for the campers had some potentially profound implications. “What we say and do really affects them,” Lorenz said. “It’s kind of a huge responsibility to keep your patience and really be aware that everyone is looking up to you. Although the seminarians’ duties at the camp were serious ones, Father Robeson felt pride in watching them be good leaders.